It's nearly payday again, and I am hopeful that maybe real soon, we will start getting some warmer weather, as I dunno bout you, but I am so ready for warmth, sunny days when you do not need 5 layers on, and evenings when you can sit in the garden without freezing your bits off. 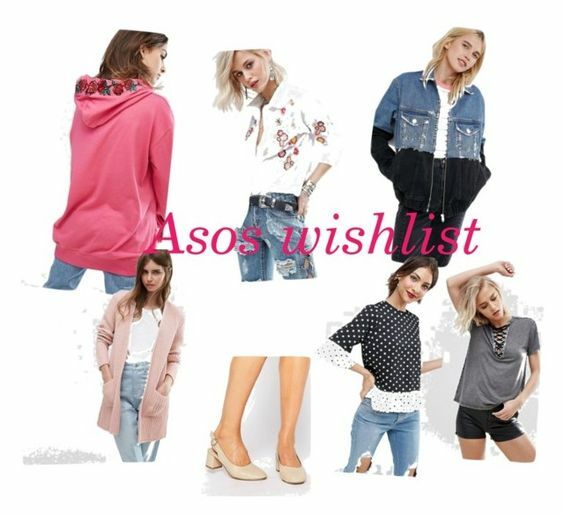 With that in mind here is what is currently in my saved items on Asos, one of my most favourite places to shop, I love that premier delivery although I must admit it can be dangerous for my bank balance. I need more embroidery in my life, that white shirt gives me love heart eyes, I am also digging that spotty top, quite feminine for me but I am really tempted to try it. What are you lusting after this payday?